Welcome to the day two of Feb Feels presents The Lunar Chronicles! Sorry for the delay. I had a long day yesterday so I didn't have the time to finish this. But here it is! Check out the [edited] schedule here. CRESS. I've been waiting for the day to be able to read this book to come. I pre-ordered Cress last year but never had the time to read it. Now I got to finish my priority to-review books, I was able to read Cress. Finally. And perfect timing for February, the month of love. So I thought, I should feature this series on Feb Feels, my Valentine-themed blog event. But this time, it's more "what I love". Not to mention the feels between Cinder-Kai, Scarlet-Wolf, and this book's pair. And dear, did I experience major FEELS! 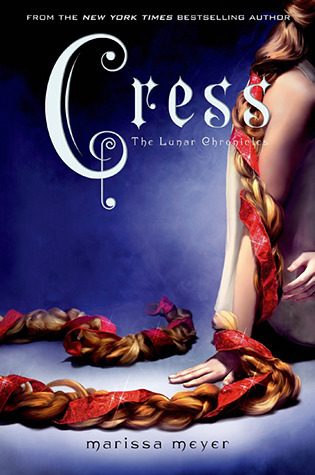 Cress was the third book from The Lunar Chronicles. Cinder, the main character, starred in the first book as the not-exactly ordinary cyborg mechanic (a Cinderella retelling). Her story continues all throughout the series but each new installment comes with new characters and additional stories and twists. No wonder readers/fans loved this series so much. Yep, including me. The second book was Scarlet, a Red Riding Hood retelling. Another one with an epic twist and connection to the Lunar Chronicles world. Cress, on the other hand, was the retelling for Rapunzel. The Lunar girl imprisoned on a satellite for seven years. And with her very own magic, Marissa Meyer told more than just a simple long-haired girl stuck in a satellite. Cress was the continuation of Cinder's journey now together with Thorne, Scarlet, and Wolf. A book that showed the meaning of true friendship and love. A book that showed that those people who has something to fight for most likely to succeed no matter how small you/people think you are than those people who just know how to fight. An exciting and will-push-you-over-the-edge-of-your-seat adventure. And so much more. Just when I thought reading about Cinder, Prince Kai, Iko, and other wonderful things in this book makes it all easy to read it, then "Captain Carswell Thorne" was there, making it more easier--and eventful (Thorne must be puffing his chest out with this compliment). Since now I mentioned him, let's talk about Thorne. I'm glad Thorne end up..let's say, useful to this series. He first appeared in Scarlet and I'm afraid that he'd be one of those characters who will eventually die in the midst of war--or worse, be part of a love triangle. He's this good-looking so-full-of-himself in a adorable-annoying-funny way. Makes the book all lighter. And he's just so hilarious and so cute. I love him so much! He had more personality than Prince Kai. I hate to say that because I LOVE Kai and he's my prince charming but I'll give some credits to Thorne, alright. Cress was a fun character too! Due to her imprisonment in a satellite for years, she became this innocent-to-the-world-outside girl. It makes her cute and funny too. She and Thorne makes the perfect pair! Their love story, however, wasn't exactly like Cinder-Prince Kai or Scarlet-Wolf, or any other pairs. Their story was much more different and all I felt throughout the book was like hugging a super cute baby and pinching her rosy cheeks or cuddling with your favorite pillow or stuffed toy, or the feeling when you received a bunch of free books. Yes, that's how it feels. And oh. My. Goodness. It wasn't just them. I have felt the deeper feelings Wolf have for Scarlet. They don't have the sweetest moment here in the book but I saw their connection and appreciated it more than on Scarlet. Let's not forget about Cinder and Kai. OMG. You guys, CINDER AND KAI! Their moments didn't last long but theirs was the one that made me jump, squee, and swoon. I am not exaggerating. My kilig (swoon) reflex did those. Swoon. Swoon. Swoon! Cress had a total WOW factor. Full of adventures, feels, revelations, and twists. A middle book in a series usually end up flat or too much or unnecessary, but this book puts up more fuel in my burning love for The Lunar Chronicles. I haven't reached 100 pages but the action and the excitement have already started and it didn't left even especially until the ending. When I closed the book, I just want more, more, MORE!!! I seriously went crazy. Fangirling all over again! I cannot imagine Marissa Meyer ever failing us. She's this brilliant person who writes magnificent books. The Lunar Chronicles world is so big that's why I also love the way she manages to keep up with the entire story and characters. It's just so sad that the end is getting nearer. I cannot imagine ending this series. I love it so much I can't think of parting ways. I know I'll always have the books but more books is different, right? I deeply love The Lunar Chronicles. I can't believe that there are still people who haven't read this. Please do yourself a favor and read them. Check out my review of the first two books, Cinder, Scarlet, and Fairest. Also, you can read my Goodreads status updates for Cress here. Hello! I love the Lunar Chronicles. I'm dying to read Winter. Anyway, where did you pre-order Cress? I went to some NBS and Fully Booked branches and they don't have any. Hi Danna, thanks for droppin by my review!